Short-chain fatty acids (SCFAs) are a major group of endogenous metabolites generated by the gut microbiota and have been reported to play an important role in physical health, such as improving energy metabolism. Here, using 2-bromoacetophenone as the derivatization reagent (BP, 10 mg/mL, 40 °C for 20 min), a sensitive liquid chromatography–tandem mass spectrometric method was established for the quantitative determination of seven short-chain fatty acids in plasma and feces. The analyses were performed on a C18 column in positive multiple reaction monitoring mode. Specificity, linearity, accuracy, precision, recovery, and stability were observed within the quantitative limits of biological sample analysis. The established method has largely improved the sensitivity by 200- to 2000-fold than that in gas chromatography (GC). Especially for butyrate, the lower quantitative limit of 1 ng/mL, 1600-fold higher in sensitivity than that of GC (1.6 μg/mL), ensured the accurate determination of its low level in blood or feces (88 ± 29 ng/mL in blood, 176 ± 18 μg/g in feces). Then, the validated method was applied for therapeutic studies of berberine in hyperlipidemia hamsters in vivo and screening of 13 compounds (including five metabolites of berberine and eight typical isoquinoline alkaloids) in vitro. After berberine treatment (oral, 200 mg/kg, 2 weeks) to hyperlipidemia hamsters, the levels of butyrate were significantly upregulated in blood (77 ± 10 ng/mL vs. 117 ± 13 ng/mL, *P < 0.05) and feces (132 ± 11 μg/g vs. 547 ± 57 μg/g, ***P < 0.001), which further verified butyrate as an active endogenous metabolite in coordination with berberine to lower the blood lipids. Additionally, the berberine metabolites (M1, M2, M3), as well as two isoquinoline alkaloids (tetrandrine and dauricine), could also obviously induce the production of SCFAs (butyrate, etc.) in gut microbiota. In total, we have successfully established a new derivative LC-MS/MS method for the targeted quantitative determination of seven SCFAs in biological samples. Shu-Rong Ma and Qian Tong contributed equally to this work. The online version of this article ( https://doi.org/10.1007/s00216-019-01793-3) contains supplementary material, which is available to authorized users. We would like to thank Shimadzu (China) Co., Ltd. for technological support. This work was financially supported by the CAMS Innovation Fund for Medical Sciences (CIFMS, No. 2016-I2M-3-011), the National Natural Science Foundation of China (No. 81573493), the Beijing Key Laboratory of Non-Clinical Drug Metabolism and PK/PD study (No. Z141102004414062), and the Drug Innovation Major Project (Nos. 2018ZX09711001-002-002 and 2018ZX09302015). All the research complied with the Institutional Guidelines & Ethics and was approved by the Laboratory Institutional Animal Care and Use Committees of the Chinese Academy of Medical Sciences & Peking Union Medical College. He CY, Fu J, Shou JW, Zhao ZX, Ren L, Wang Y, et al. 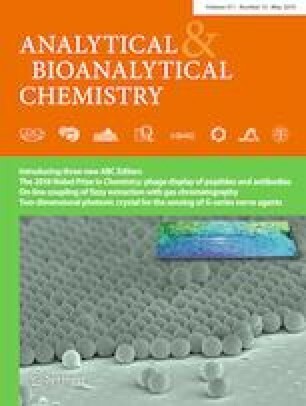 In vitro study of the metabolic characteristics of eight isoquinoline alkaloids from natural plants in rat gut microbiota. Molecules. 2017;22(6). https://doi.org/10.3390/molecules22060932.